Five years ago, April 27th 2013 our Dutch Prins of Orange Willem-Alexander became a true King of the Netherlands. Due to this amazing event, we decided to design a ring which would symbolise a farewell to the greatest Queen, nowadays princess Beatrix and a welcome to a new King and Queen Maxima. How it works: In Holland, when becoming a King you'll get a free and extra royalty bonus: a Queen! In this case, a King and Queen in one day! During the Dutch "Kingsday" festivities in on April 27th. 2017 (Breda, NL) our majesty King Willem-Alexander and Queen Maxima were given a delicious bite [fingerfood] of BBQ-Chef Jacques in 't Veld of 'El Hambre'. With this amazing treat for our royalties, three 'coronation rings' were prepared and attached, ment for our three royal princesses, Amalia, Alexia and Ariane. The mazing thing happened that her Majesty Queen Maxima decided to wear the 'Coronation ring' on her pinky-finger! Part one is the base, the ring, with room for a coin on top. Part two is the Dutch 10coin of (Queen) Beatrix on profile glued on top of the base. Part three is the 3D printed royal crown, according to the actual Royal Dutch Crown. 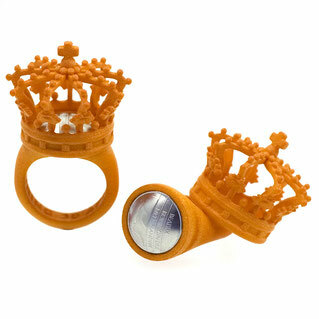 This crown can be (re)placed on the base, in any style you want to wear the ring. One Size: 56 | ø 18 mm.